Single RCA Wall Plate Coupler, Yellow Indicator (Gold Plated) + FREE SHIPPING! Have you ever gone shopping only to discover that the product you're looking for doesn't exist? They have things either side of what you really need, but right there in between the lines is a niche market so small only you fit into it. Luck is with us now, though, because this single female-to-female RCA coupler (with yellow band) will allow you to customise your blank wall plate to carry only the combinations of colours your setup desperately requires! 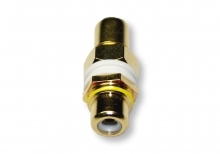 This RCA Coupler has a Yellow Indicator to help colour code your wall plate, and can be used with Digital Coaxial and Composite cables/connectors. We were very happy with your service. We live in the country and so it was so convenient to order online. The cable arrived very promptly - thank you. We will certainly use your service again.